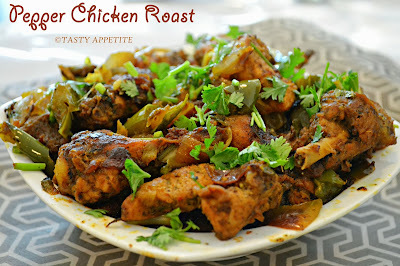 Here’s one of my favorite Chicken Roast recipe which is a huge hit at my home as well as with friends. This spicy and delicious chicken dish roasted in dry pepper and aromatic spices tastes wonderful as a starter or side dish with rotis. 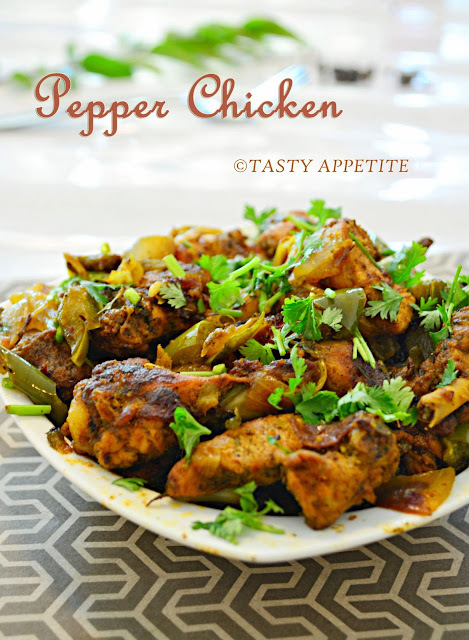 Also this tastes good with rice, idly and dosas. 3. Marinate the chicken pieces with turmeric pwd, red chilly pwd, salt, lemon juice, coriander pwd, ginger garlic paste, pepper pwd, fennel pwd and a tsp of oil. 4. Dice onion, capsicum to cubes. 5. Slit green chilly to lengthy slices. 6. 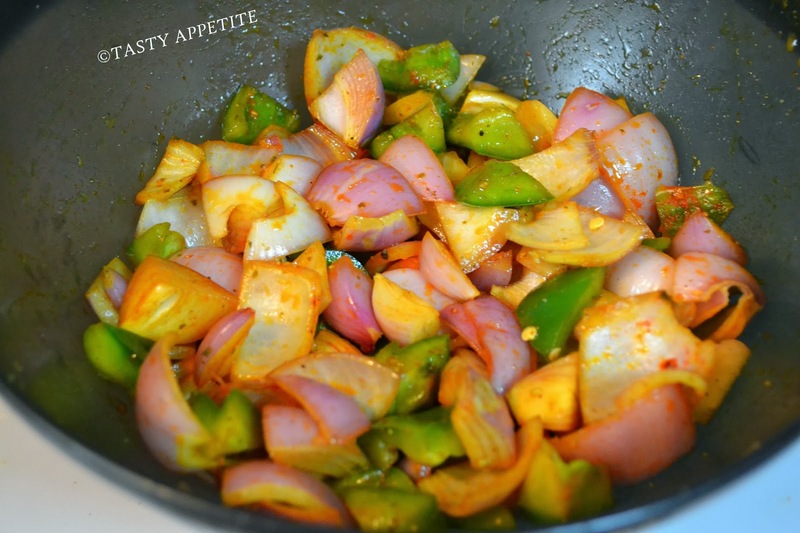 Add the diced onion, capsicum and green chilly to the chicken marination and mix well. 7. Allow it to marinate for 1 hour. 9. Pick the marinated chicken pieces from the marinade. 10. Shallow fry the chicken in the heated oil until it is slight brown in color. 11. Drain the chicken from the oil and reserve. 12. In the same oil, add ginger garlic paste. 13. Saute for few minutes. 14. Add the remaining mixture of onions, capsicum, green chilly along with the marinated spice mixture. 15. Once the onion is completely cooked, add tomato ketchup and cook for a minute. 16. Add the fried chicken and mix well for a minute or two. 17. Taste and adjust salt and spice level by sprinkling pepper pwd. 18. Cook covered for 5 mins in low flame. 19. 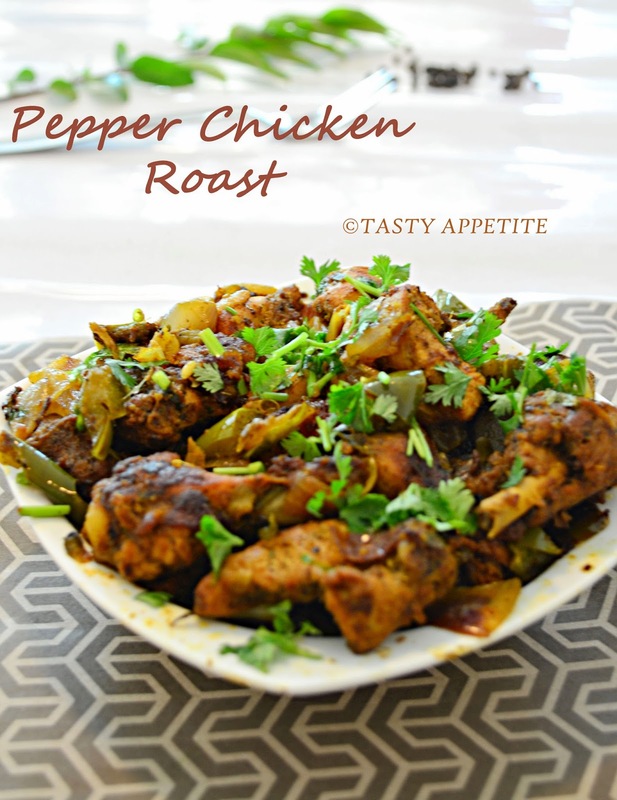 Drizzle a tsp of oil to the sides and roast for a few minutes on high heat. 20. Turn off flame and add few drops of lemon juice. 22. 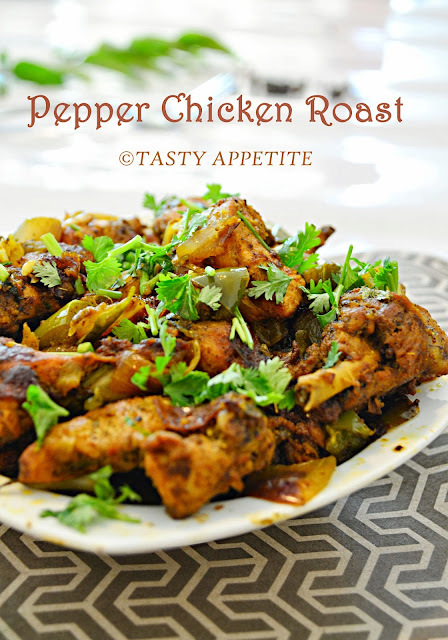 Spicy Pepper Chicken Roast is ready. 23. Serve hot with freshly chopped coriander leaves. 24. 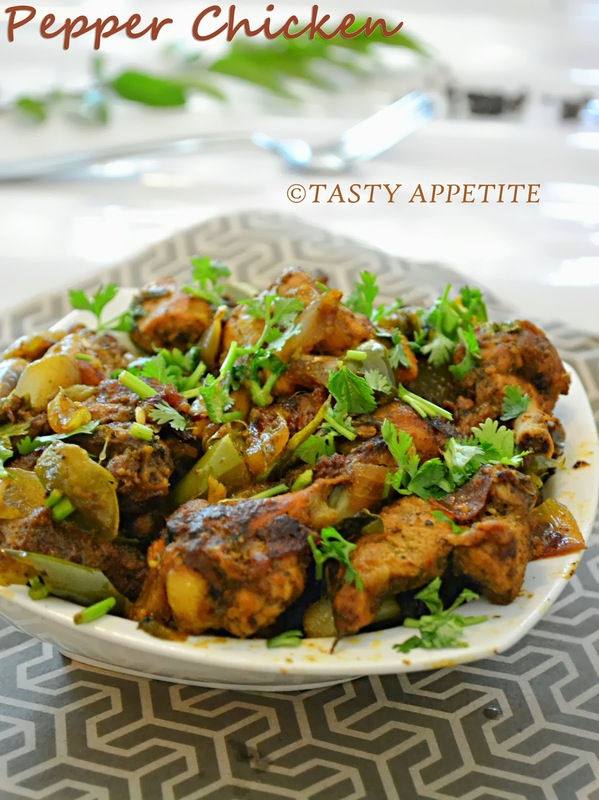 This versatile chicken dish makes a perfect accompaniment with chapti, roti, naan, paratha or with any rice preparation. yumm, I want a piece of that chicken!!! look so good! I'm so hungry by just looking at ur clicks dear,......so yummy!! 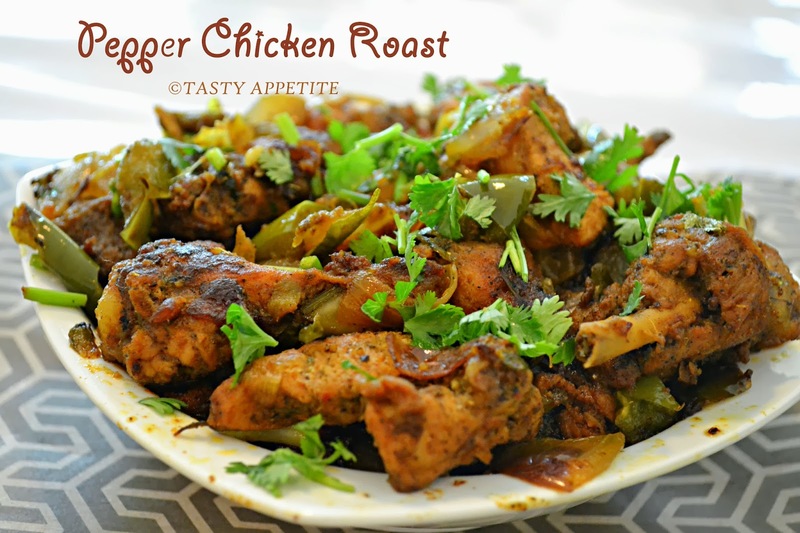 Finger licking good chicken fry.